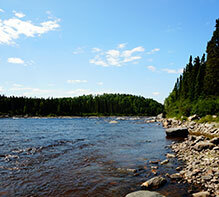 The proposed Lac-Dana biodiversity reserve is located in the Nord-du-Québec administrative region, between 50°46’ and 51°0’ north latitude and 77°3’ and 77°27’ west longitude. It is situated some 115 kilometres to the north-east of Matagami and some 97 kilometres to the south-east of the Cree village of Waskaganish. It covers an area of 347.4 km² and lies within the territory of the Municipalité de Baie-James, which does not belong to an RCM.